At Signavio, we focus on building great products first and think about market success afterwards. ‘Product’ not only means award-winning features and industry-leading functionality, but also includes the service we provide to customers, and the thought leadership and guidance surrounding our technology. We strive to discover what’s possible and care deeply about product innovation and quality. But even more importantly, Signavio cares about people. This not only includes how we work together as a team but how we interact with our customers. Implementing Signavio is one of our best business decisions. Thank you, Signavio. Veritas Technologies LLC was founded in 2016, after demerging from Symantec, and is the world’s leading data management service provider. Veritas specializes in data protection and multi-cloud data management for enterprise customers globally, and offers the first journaling file system. Veritas services 86% of Fortune 500 companies, plus thousands more worldwide, and employs over 7,500 people globally. 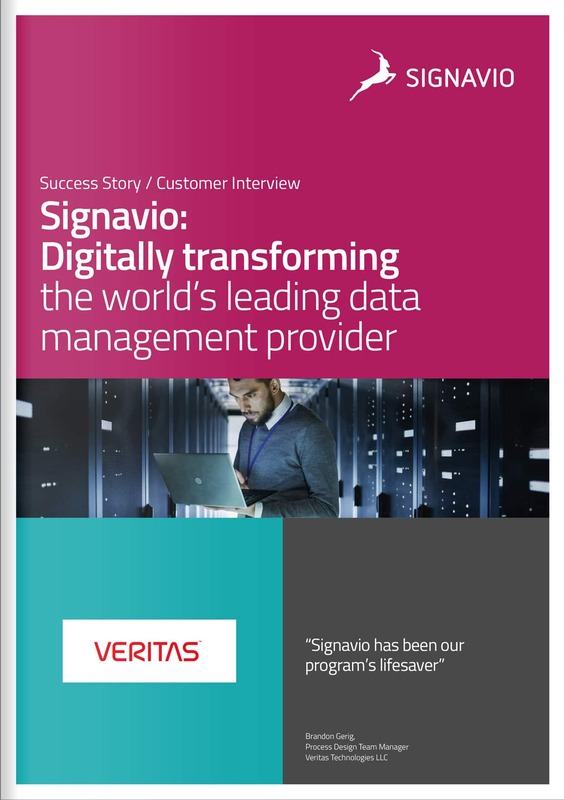 In this special interview with Brandon Gerig, Veritas Process Design Team Manager, we learn how this multi-billion dollar company, and Gartner Magic Quadrant industry leader, has benefited from using Signavio for fundamental process change, digital transformation, and better decision management. Can you please tell us about your position at Veritas? What would you say is the company’s operating philosophy and the way you approach your work? I work with the Veritas Support and Services team. Basically, if it breaks, we fix it. We cater to over 1,600 employees across six major support sites. Let’s just say; I never get bored! Veritas operates under the credo of unlocking truth held within information. At the core of what we do is turning raw information into viable, actionable data. As such, I approach work holistically, ensuring we look at processes from beginning to end. We need to understand the upstream, downstream, and cross-stream effects of any changes we are implementing. What are the particular challenges you are faced with in your daily work? Especially any that are unique to your industry. In being a global support organization, one of the key challenges I face daily is the consistency of process across our sites. Also, adding to the complexity of the work performed by our Support Engineers, it can be quite daunting to ensure that all knowledge workers follow the same process for each customer interaction. Agreed, that does sound daunting! The stability of your processes is obviously a fundamental cornerstone of your success, and your customers’. So, what was the reason behind starting a process improvement initiative with Signavio in 2016? Let me cut to the chase; we were drowning in processes and documentation. Signavio has been our program’s life saver. The software has allowed us to focus more on strategic initiatives, rather than continually following stakeholder documentation. In fact, Signavio changed the entire landscape of our process program. I cannot overstate the power of visual process depictions. We faced enormous struggles with business stakeholders at each of our six unique support sites because they were working from their own ‘best practices’, which often contradicted or conflicted with the other support sites globally. There were also multiple process repositories and a sea of PDFs. Through Signavio, we were able to reduce our repositories from nine to one, and we were also able to take over 800+ PDF documents and visualize them. In fact, we now have just 75 PDF documents, and around 65 BPMN visualizations. It is a pleasure to be working with Signavio. Wow, that’s great! I’ll give a shout-out to the entire Signavio family. Tell us, what goals do you want to achieve with the initiative? How has Signavio empowered your strategy? Signavio has saved us from some costly decisions being made. The technology fixed problems before we even got started! This overview has been pivotal. Since implementing our program with Signavio, we have been hitting our consistency goals and our strategic process drivers. The learning curve to get over 1,600 employees globally to use and interact with the Signavio solution now only takes a 15 minute training video. It has become that simple. We are also able to map out proposed projects and present them to our leadership team quickly, logically and concisely. Great! 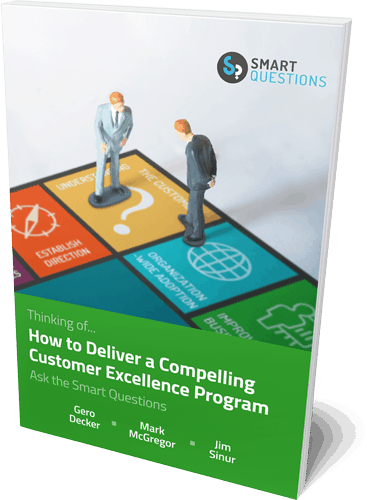 Who was the key driver behind your process transformation initiative? My Director and my team were the drivers of this change. The Director put out the vision, I found Signavio, and we then implemented it. Implementing Signavio is one of our best business decisions. Before you engaged Signavio, were you documenting processes in any other way? PDFs and Microsoft Visio were the banes of our existence before Signavio! Thank you, Signavio. OK, I think I know the answer to this already, but here goes: Has process management become a part of company culture? I can’t be in a conversation at work where the word ‘process’ isn’t used! We are continually looking at how we can be doing things better for our customers and our internal stakeholders. Signavio has allowed us to improve the way we work, and how we work. So, has Signavio enabled you to reach the goals you set? Amazingly enough, we were able to reach our goals! Signavio provided the stabilization we so desperately needed. Now we can focus on strategic initiatives. Thinking about it, if there is only one thing I would have done differently during this project; it would be to have found Signavio sooner. Veritas Technologies LLC was founded in 2016, after demerging from Symantec, and is the world’s leading data management service provider. Veritas services 86% of Fortune 500 companies, plus thousands more worldwide. The company employs over 7,500 people, globally.